This pack provides improvements to common sounds in the game, making the sounds feel more immersive and real. Takes the simulation to a whole new level! It is preferred to put this at the top of your Mod Manager, at least above MAP mods and AI TRAFFIC mods for full experience of sounds. Otherwise results may vary! 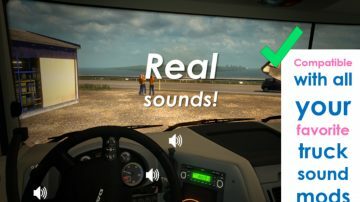 Changed default AI traffic truck/bus engine sounds. Now has more variety of engines in set of sounds and smoother volumes. * Real interior and exterior tire sounds. Tires will resonate in the cab depending on how fast you’re accelerating and what speed you are in, giving a feel for your sense of speed. * Light and medium impacts can trigger cabin squeaking and movement of the cabin. * Hard impacts can trigger key swinging. * “Late music” replaced with Nokia phone ringtone sound (volume of this sound depends on Music volume in Audio settings in-game). * Classic/historic ding sound for while the fuel is pumping (circa 1960s to 1970s). The number of dings can give you an idea on how much you refueled. * Real stick/switch/button sounds for: parking brake, hazard light, wiper stick, blinker / indicator / turn signal, light switch. * Includes air brake hose deattachment sound when uncoupling. * Motorcycles from Jazzycat’s AI traffic pack and JLTruck’s AI traffic pack given proper motorcycle engine sounds. * Motorcycles will rev engine instead of using a car horn when blocked. * Dedicated engine sounds for a selection of AI traffic trucks. * Louder volume and reworked audio for various moving objects including biplanes, trains (included train horns), etc. * Enabled sound for some moving objects that don’t originally come with sound (e.g. F22 jet fighter in American Truck Simulator). * Prefab (i.e. 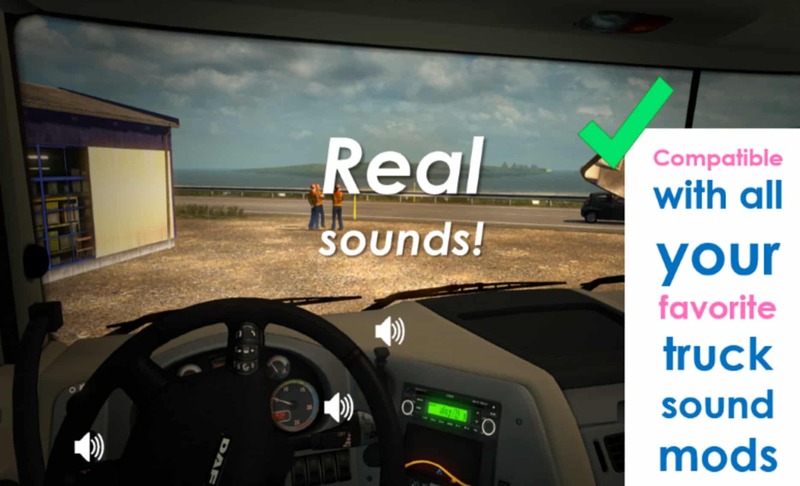 company and delivery points) soundscape enhanced for American Truck Simulator (includes both daytime and nighttime ambience). * Iceland coastal ambience for ProMods (wind, waves, very distant seagulls). * Suitable volume of nature ambience for ProMods and RusMap when opening the window. ETS2 1.24.4 + ATS 1.3.x. No errors in game log. Must be placed in high priority in Mod Manager. Compatible with all trucks, including truck mods. Supports compatibility with Realistic Weather Sound 1.7.6 (provides realistic thunder and exterior rain sounds). Both mods can be enabled at the same time. 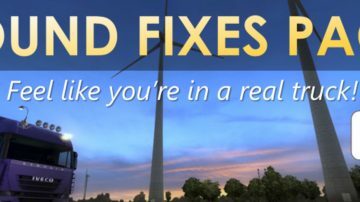 Sound Fixes Pack must have higher priority.